Last updated on April 23, 2013 August 29, 2018 by Mike Thomas for Armagard Ltd. Outdoor digital signage specialist, Armagard, has won the prestigious Queen’s Award for Enterprise for their contribution to international trade. 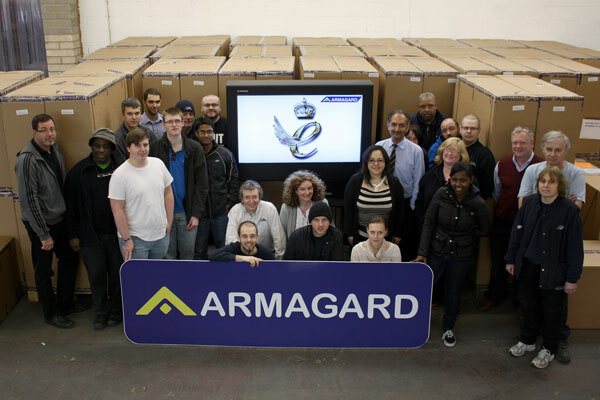 UK manufacturers, Armagard, who export protective enclosures to ensure safe working environments for outdoor digital signage screens, computers, printers and other electrical hardware, have been awarded the 2013 Queen’s Award from Her Majesty Queen Elizabeth because of their success in overseas markets. Birmingham-based Armagard has achieved substantial growth in overseas earnings over the last three years, with exports growing by over 300%, allowing the company to expand and become a leading player in the outdoor digital signage market. The Queen’s Award for Enterprise is awarded to UK companies for outstanding achievement in innovation, sustainable development or international trade. Armagard became the recipient of the 2013 award on 21 April for their contribution to international trade. Armagard trade globally, in territories including the USA, Europe, Middle East and South America, and the company put down their export success to planning and focus, which started as the UK was plunged into recession. “We conducted a strategic analysis of overseas markets and competitors, and formulated a targeted market entry strategy to grow export sales within outdoor digital signage. All this was prior to the recession but we decided to continue the plan against the advice of some of our then financial advisor’s as the recession hit in 2008,” says Managing Director Mark Neal. Despite the UK spending several years in recession and subsequently experiencing limited economic growth, Armagard’s focused international trading strategy, which centered on the USA and Europe, saw the company’s export sales grow exponentially and increase by over 300%. Armagard’s strategy has seen foreign sales increase from just 6% of annual turnover in 2007, to 63% by 2012. The Queen’s Award for Enterprise is an annual prize awarded to UK businesses for outstanding achievement. The award for international trade is only awarded to companies that can show substantial success over three years, and who are considered outstanding for their size and for the sector in which they trade. Her Majesty the Queen chooses the winners of each year’s award after taking advice from the Prime Minister’s Advisory Committee, and she selected Armagard for the 2013 award for international trade. “We are delighted to receive this Queen’s Award after an excellent three years of export growth. It took exceptional planning and execution to succeed on this international level, but after the outstanding hard work of the Armagard team, we take great pride in our achievement,” Mark Neal adds.